I was shocked when I saw times person of the year cover. I was expecting a humanitarian or world leader but instead saw a computer and the word “You”. “Yes you” it reassured. You control the information age. There were so many deserving people this year. So I was surprise and well as humbled to learn the person of the year was, in fact, me. Fortunately I had prepared a brief acceptance speech because you just never know. Wow, I can honestly say I didn’t expect this. JFK, MLK and now me. And to think a year ago, I was running windows 98 with an infected hard drive and had 3 friends on my myspace including Tom. I could never been POTY without a lot of help. I’d like to thank the Numa Numa guy, Ok Go, Chad Vader and LonelyGirl15. I’d also like to thank everyone who downloaded my mashup of Panic at the Disco vs. Loudon Wainwright III. Al Gore, loved your movie; I watched it on a file sharing site then burned DVDs for all my friends. Kim Jong-il, I really thought you had me when you detonated that nuclear device, this is always next year. As you read on my BLOG, my road to person of the year was not without a few bumps. I dropped almost 300 bucks on a Zune that was supposed to connect me to new music and friends; it might have if anyone else had actually bought one. I also lost my job when I spent three days camped out at a Best Buy chasing a PS III, but as my fellow POTY, Winston Churchill once said, “Victory at all costs”. Now as I join the company of Popes in the immortal pages of wikipedia I am reminded that my work is far from done. There will always be witty IM’s to compose and A-team parody webisodes to produce. There will always be camera phone pictures to Photoshop and more guitar hero songs to unlock. 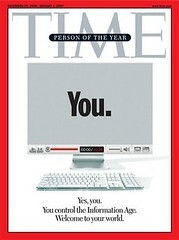 In conclusion, I want to thank you for making me your Person of the Year. Not only because it is a great honor but chiefly because it will look really cool on my facebook.com profile. Categories: Art, Events and Culture, Humor | Tags: Person of the Year, POTY, Time Magazine | Permalink.